Ceylon cinnamon is a spice made from the ground inner bark of a tree native to Sri Lanka, which once was known as Ceylon. It has been used in traditional medicine for centuries, and modern research confirms its anti-inflammatory and antioxidant benefits. The spice has also gained a reputation as a weight loss aide, although more evidence is needed to confirm this claim. Consult your health-care practitioner before using Ceylon cinnamon therapeutically because of potential side effects and drug interactions. Cinnamomum verum, or Ceylon cinnamon, is considered “true” cinnamon compared to other species in the same genus. Other varieties, particularly cassia cinnamon, contain a compound called coumarin that presents a risk of toxicity. It is not always possible to tell which species of cinnamon is in the spice that you buy in the supermarket, but you can tell the difference in the quills, or sticks. Ceylon cinnamon sticks appear rolled in one continuous direction, like you might roll up a newspaper. In contrast, the opposing ends of cassia or Indonesian cinnamon bark meet in the middle to form a center ridge. Ceylon cinnamon contains various active compounds, including volatile oils such as cinnamaldehyde, eugenol and hydroxycinnamaldehyde. A proanthocyanidin in the spice called cinnamtannin B1 has been shown to improve fasting blood glucose levels in people with type 2 diabetes, a condition characterized by insulin resistance. This effect appears to be due to the compound stimulating insulin receptors in adipocytes, or fat cells. 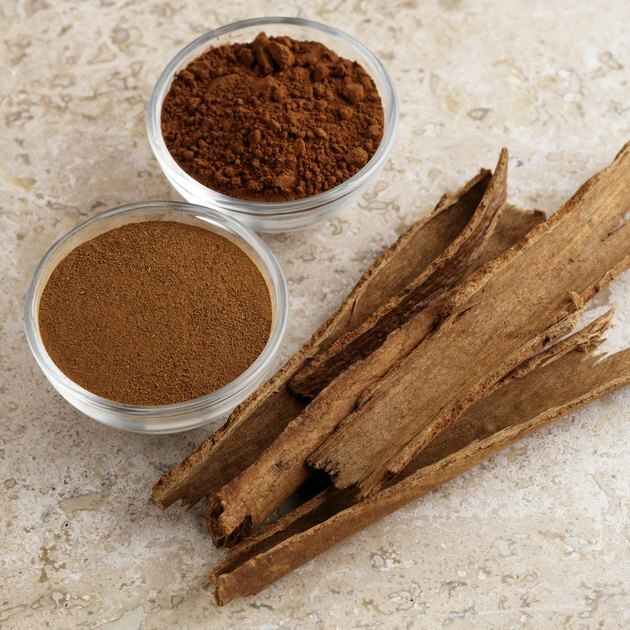 The presence of cinnzeylanin and cinnceylanol increase gastric secretions and explains the traditional use of cinnamon to stimulate the appetite. In theory, this activity may also improve digestion and enhance the break down of fats. To investigate the effects of certain agents on adipogenesis, the technical term for the deposition of fat, scientists often use immature fat cells from mice called 3T3-L1 pre-adipocytes. According to a study published in "Journal of Agricultural and Food Chemistry” in April 2011, cinnamaldehyde regulates a receptor gene and an enzyme known as AMP-activated protein kinase to prevent these cells from becoming mature adipocytes. The result was a decrease in weight gain in rats fed a high-fat diet. In addition to weight loss, the authors of the April 2011 "Journal of Agricultural and Food Chemistry” study also found a decrease in serum cholesterol with cinnamon supplementation. In the September 2010 issue of "Archives of Biochemistry and Biophysics," scientists report that cinnamon improves insulin sensitivity and reduces the accumulation of white fat in adipose tissue, the kind that “pads” your body. Cinnamon may exert estrogenic effects, so it should not be used during pregnancy or if you have a history of a hormone-related disease, such as breast cancer. Because this spice may increase gastric secretions, use it cautiously if you have a history of peptic ulcers. If you have diabetes or take other medications, check with your doctor before supplementing with Ceylon cinnamon.